The Primate of All Ireland, Cardinal Seán Brady, was joined by religious and civic leaders in Drogheda for Sunday’s procession and Mass to mark the anniversary of the canonisation of St Oliver Plunkett. The procession began at Holy Family Church in Ballsgrove, which is south of the River Boyne and therefore in the Diocese of Meath. From there it proceeded to the National Shrine of St Oliver Plunkett in St Peter’s Church on West Street in the Archdiocese of Armagh. 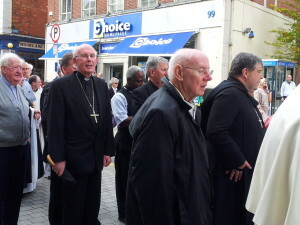 Among the participants were the Mayor of Drogheda and a number of pilgrims from Germany who marked the Irish Saint’s links with Lamspringe, where he was buried for a time. Cardinal Brady was the principal celebrant of the Mass and Bishop Michael Smith of Meath concelebrated along with Dom Aidan Bellenger, Abbot of Downside Abbey, who also preached the homily. In his homily, Dom Bellenger said that despite the extraordinary sufferings in St Oliver’s life, he was faithful to the Lord and Lord was faithful to him to the end. “For me it is a great privilege to be here today,” the Abbot said and explained that every day for the past 36 years he has passed the relics and tomb where St Oliver is buried in Downside Abbey. 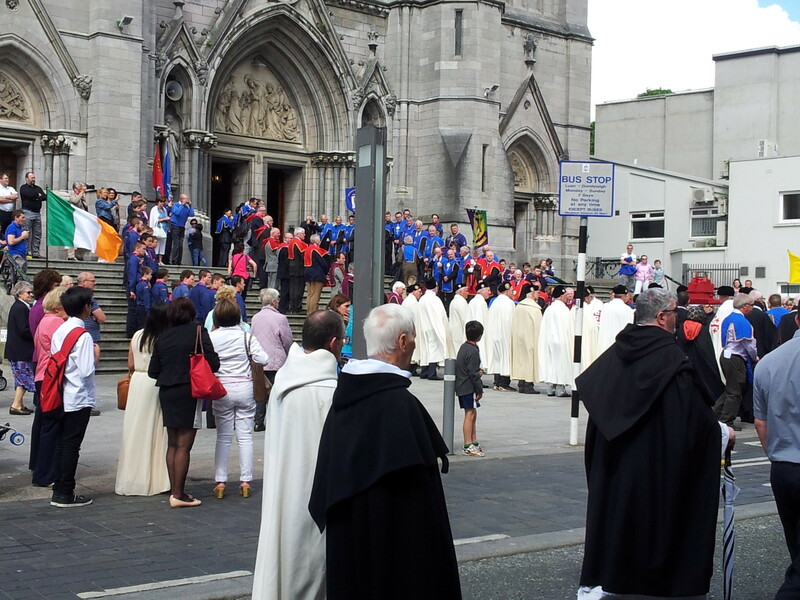 Procession of St Oliver Plunkett’s relics into St Peter’s Church in Drogheda. He explained the link between St Oliver and Downside and the reason for the Saint’s many burial places. He said the martyred Archbishop of Armagh’s sense of hope never left him, even on the scaffold of Tyburn. “He showed how to walk in God’s footsteps,” the Benedictine commented. Downside Abbey also preserves a number of St Oliver Plunkett’s letters and the Abbot said they were “evocative prison letters” by Ireland’s proto martyr who “led by example”. St Oliver Plunkett, a former Archbishop of Armagh and Primate of All Ireland, was ordained a priest for the Diocese of Meath in 1669 and was martyred in Tyburn, England, in 1681. He was canonised as a martyr by Pope Paul VI in 1975. Each year thousands of pilgrims visit St Oliver Plunkett’s shrine in St Peter’s Church, Drogheda, Archdiocese of Armagh, to venerate his relics and to learn about the saint’s extraordinary life story. Pilgrims pray for the sick and troubled, for family and friends. They fittingly turn to Saint Oliver, who was martyred for his faith in a time of political, religious and social turmoil, to pray for his intercession concerning conflict areas at home and abroad.